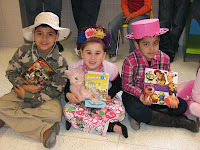 On January 27, 2011, students and staff members at General Ricardo Sanchez Elementary enthusiastically celebrated the 100th day of school with a Book Character Parade organized by the library department. Students got to dress as their favorite book character and parade around the school as they celebrated reading and 100 days of learning. Additionally, Pre-K-2nd Grade students participated in the 100 countdown of released balloons and many other educational activities that made their 100th day of school a memoir.